The 4th-game of the Ouza Title Match has been played today. 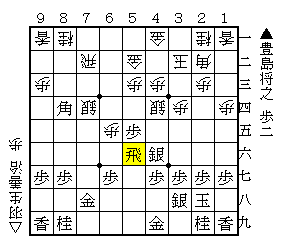 I was surprised that the Challenger Toyoshima had played Central Rook Strategy, despite a static rook player. And Habu selected a countermeasure, a Silver-63 rapid attack. 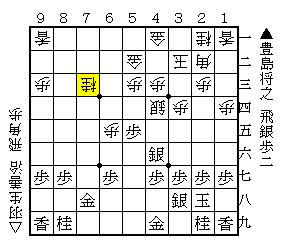 Although △S-74 is usually said to be a bad shape as the silver advances far from the opponent's king and the knight on 81 becomes difficult to jump, △S-65 or △S-85 is the aim in this strategy. From here, oppressing the pieces with the two silvers will be important for gote. ▲R-56 was a bold move because the gold on 78 would be a floating piece. 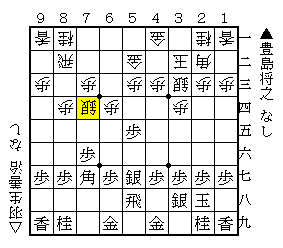 At a glance, △S-83 may look severe for sente, however, Totoshima naturally had calculated that during about one hour thinking. From ▲P*73, a slashing sequence, including the major pieces exchange continued. After the sequence, watching this position, I couldn't say clearly which side got a won position in spite of the bishop-silver exchange. Here, as sente could make the promoted pawn with △P*74, it might be keeping the balance. Now, the position is at Diag.4. I suppose Totoshima is slightly better. The promoted pawn on 73 will be able to trade a gold. But, sente's two promoted bishops have a big influence on the board. A long endgame will still go on. As you mentioned, beginners (like myself) rarely play the side pawn picker, probably due to being scared by the complications, and the risk of losing immediately. At the recent European Championship, e.g. I did not see it in any, but 1 game! Once again, thanks a lot for an interesting blog with very good subjects. In the side pawn picker, Bishop-33 Strategy (against Rx34) is especially popular among pro games. That strategy has high winning percentage despite first-mover advantage, e.g. 53% in this year. As you say, I think there is the gap between pro and amateur players.